There is a tremendous amount of press this week about Apple having rejected the submission of an iPhone game which lets you "Throw a shoe at US President Bush". Of course, fans of illumineX know that this isn't the first time such an application has been rejected. A few weeks prior to the election of US President Obama, Apple rejected our own application, iFlinger. 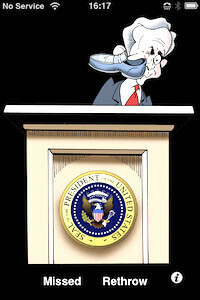 To support your right to fling virtual shoes at cartoon caricatures of public figures, please join our FaceBook group!